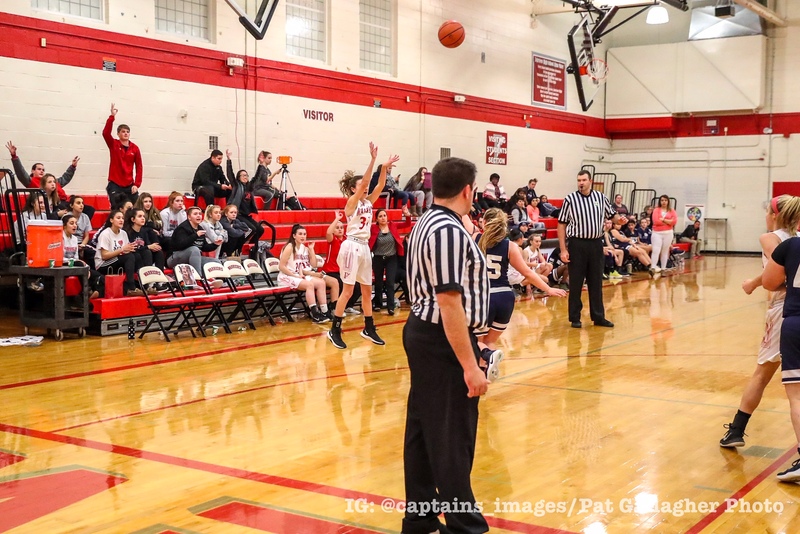 The Lady Warriors opened up home play with a win on Wednesday night when they took on Valley Forge. The first half seemed to be trending in the direction of a slow paced, low energy game; however, the Warriors managed to turn it into an electrifying, record-setting night — led by Senior Rachel Coyne. With about 40 seconds left in the first half, the Warriors turned the ball over. Coyne sprinted the length of the floor as Valley Forge tried for a transition layup, planted her feet on the lane line, and took a charge. Then with the clock winding down toward zero she came up with a steal. And just like that, with two plays in 40 seconds, Coyne triggered an energy shift for the rest of the game. Coming out of the half it appeared that both teams had increased the intensity, with Fairview outscoring Valley Forge 12-6. Although they scored only 15 first half points, the Warriors went on a tear and finished the 3rd quarter strong. First, Rachel Coyne hit a step back three and then promptly forced another Valley Forge offensive foul to push the lead to 20-12. Julia Costas would sink 2 free throws on the next trip down. The Warrior’s pressure defense forced another turnover and two possessions later, Coyne sunk another 3 ball (her 4th on the night) on a Jada Witnik assist. Julia Costas’ pressure defense in the half court earned her a deflection all the way back to the Warriors baseline. Valley Forge was forced to inbound and go the length of the floor, allowing Fairview to set up their press. Costas got a steal out of a trap with Rachel Coyne, leading to a transition bucket by Meghan Weir. The following possession Costas came up with another take away to end the quarter. The Warriors carried that momentum into the 4th quarter where they had a party from 3-point land. On their first possession, Costas found Coyne in the opposite corner for her 5th 3-pointer on the night. Three possessions later Costas threw a pass across the court to the same corner; this time she found Lindsey Hill for three. The following possession looked like a replay when Costas found Coyne again for three, this time from the wing — her 6th on the night and a new school record. The very next possession was a role reversal as this time Coyne found Costas on the perimeter for three more. The Warriors went back to the other end, forced a turnover and pushed the ball down the floor when Meghan Weir found Coyne standing open at the wing again…Coyne broke her own record as she splashed her 7th 3-pointer of the game. The Warriors hit five 3-pointers in just seven possessions to start the 4th quarter and put the game out of reach. As a group they broke the team record for most 3-pointers in a game with 11, shooting 53% from behind the arc. Rachel Coyne shot a blistering 70% from 3-point land, going 7 of 10, and now stands alone on the record board for most 3-pointers made in a game. The ladies are now 3-0 and look to carry the momentum into this Saturday as they open up PAC play against a tough Buckeye team. JV tips at 1:00pm with Varsity following at 2:30.